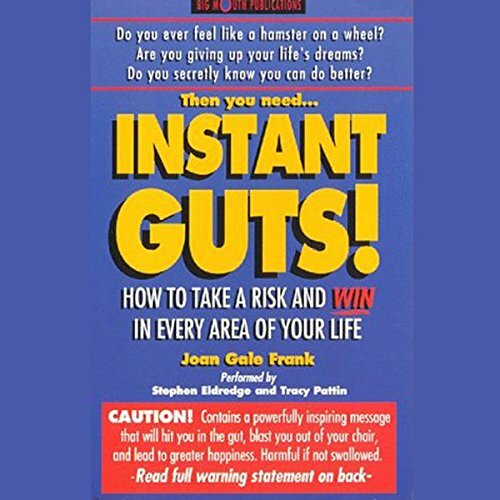 Instant Guts! is a powerfully moving audio program that will inspire you to take intelligent risks in business, creativity, and relationships. Apply it to your ears to promote courage, inner strength, and determination. After listening, you'll know how to identify the best risks for you to take, the exact steps to launch you into action, how to beat the 10 big excuses that hold us back, and how to make your fears, anxieties, and past mistakes work for you. Above all, it will show you how to make risk-taking easier, faster and more enjoyable than you ever thought possible. It's a fast, fun blast of inspiration that will get you going and keep you going from the first day forward. The book pulls no punches and I listen to it when I am down on myself or I am in a funk. This book pulls me right out it. This book shows the things that got to be done to succed at anything in a simple and friendly way. Good narrating !!!!! Great first book for newbies to self-development! This book is worth its cost. It is a great book for those beginning self-development; Or those in need of an hour pump you up talk. I knew the information already, but I still appreciated the narration and lay out. MADE ME WANT TO DYE MY HAIR BLUE AND RUN DOWN TO ATLANTIC CITY.